Jim wrote Changed into His Image out of a burden to provide his three daughters a realistic, practical, and biblically-sound understanding of spiritual growth, progressive sanctification, and discipleship. Nineteen years and over 100,000 copies later and in its second edition, Changed into His Image has been used around the world in equipping the saints to maintain their day-to-day walk with the Lord and recognize and overcome the habits that commonly hinder spiritual progress. Taking Time to Change, the accompanying workbook, guides readers as they meditate on Scripture and apply the biblical principles in Changed into His Image to their daily lives. The Changed into His Image Student Edition simplifies the message for a teen audience or for adults who struggle with reading and comprehension. Please note: Taking Time to Change, Changed into Is Image—Student Edition, and the Spanish edition are temporarily out of print but should be available again in the Fall of 2019. Thank you for your patience. The DVD series for Changed Into His Image is no longer available but mp3 audio files of the lectures are available at www.changedintohisimage.com as free downloads. Changed into His Image is also available in Spanish, Portuguese, German, Russian, and Chinese. For more resources in using Changed Into His Image please visit www.changedintohisimage.com. Essential Virtues by Jim Berg draws from the principles of 2 Peter 1 to explore the marks of the mature Christian life. Peter lists the virtues of a Christlike believer: commitment to be like Jesus (virtue), knowledge, self-control, endurance, godliness, brotherly kindness, and love. As believers understand the meaning and importance of these core virtues, they can learn to cultivate these qualities while avoiding worldliness, rebellion, and spiritual apathy. Berg’s clear application encourages personal Bible study that will result in true biblical maturity. Essential Virtues includes study-guide questions for personal reflection. In the Essential Virtues DVD series, Jim teaches an overview of each of the thirteen chapters. The series is often used for individual study and for group learning activities. Freedom That Lasts® is a Christ-centered, Bible based, local-church-focused discipleship ministry to those enslaved to life-dominating sins or overcome by hurtful events of life. While the program is geared towards a weekly local church ministry to addicts, the curriculum can be used for individuals who need to overcome various kinds of substance and behavioral addictions. In addition, the curriculum provides solid accountability and instruction for any believer who simply wants to grow in his likeness to Christ. Freedom That Lasts® offers a full line of adult, teen, and prison tools for discipling those struggling with life-dominating habits and hurtful life events. For more information about starting a chartered chapter in your church or for ordering individual components of the curriculum for your own use in personal growth and discipling others, go to www.FreedomThatLasts.com. In God Is More Than Enough, Jim Berg offers practical wisdom for overcoming the stresses of life and finding God’s peace. This book ministers to Christians who have reached the end of their own strength and are ready to develop their personal walk with and confidence in their Savior, Jesus Christ. Readers will get a closer look at the heart of God—His love, His mercy, His faithfulness, and His power to help those who are suffering. This book is adapted from the Quieting a Noisy Soul Counseling Program. In this, his second book, Jim Berg offers the reader a study through the major themes of Ephesians and takes an enthusiastic look at the fullness of joy and the victorious life available to every Christian who comes to a clearer understanding of God’s purpose in redemption. He also takes a probing look at pitfalls and misconceptions that commonly weaken believers. The thirteen-week accompanying workbook, Taking Time to Rejoice, provides the personal application of biblical truth for disciple-makers working with individuals or small groups. In addition, Jim provides an overview of each chapter in the Created for His Glory DVD series for use with groups and individuals. 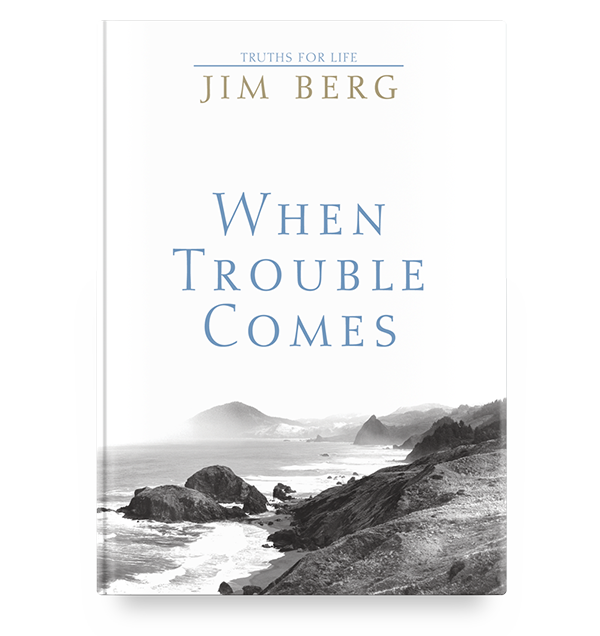 In this small format, eight-page, hardback book, When Trouble Comes, Jim Berg presents four truths for believers who are facing a crisis of life. These truths act as “spiritual CPR” to stabilize Christians or those they are helping in the event of sudden calamity. These truths are the spiritual anchors for those whose minds are spinning and perhaps numb from unexpected tragedy and suffering. The book is especially helpful when believers are trying to minister to unbelieving loved ones, coworkers, and neighbors who need to hear the gospel presented in a compassionate and hopeful manner during their crisis. Hospital, military, and first-responder chaplains have distributed this book widely in their ministries to those in their care. Churches have given the book to first-responders in their communities at annual church services honoring those in the community who serve them. Jim dedicated the book to those who lost loved ones on September 11, 2001 so that readers would understand that God through His Word has provided the comfort and direction needed in times of crisis. The separate fifty-page When Trouble Comes Study Guide guides the user through a four-week Bible study applying the four truths for times of trouble contained in the book. This is an excellent evangelistic Bible study when ministering to the lost who are facing trouble. For more resources in using When Trouble Comes please visit www.whentroublecomes.com. This twenty-four page treasure offers to new believers a wealth of simple explanations for sometimes complex topics such as resisting temptation, sharing your faith, finding God’s will for your life, and personal Bible study. it is a valuable handbook for new believers, who will find it a helpful tool for spiritual growth, and for seekers, who will find answers to their most basic questions about what it means to believe and how to come to Christ. It is also helpful for seasoned believers, who will want to keep it on hand as a reference and to share with those they are ministering to. Available in French and Spanish.